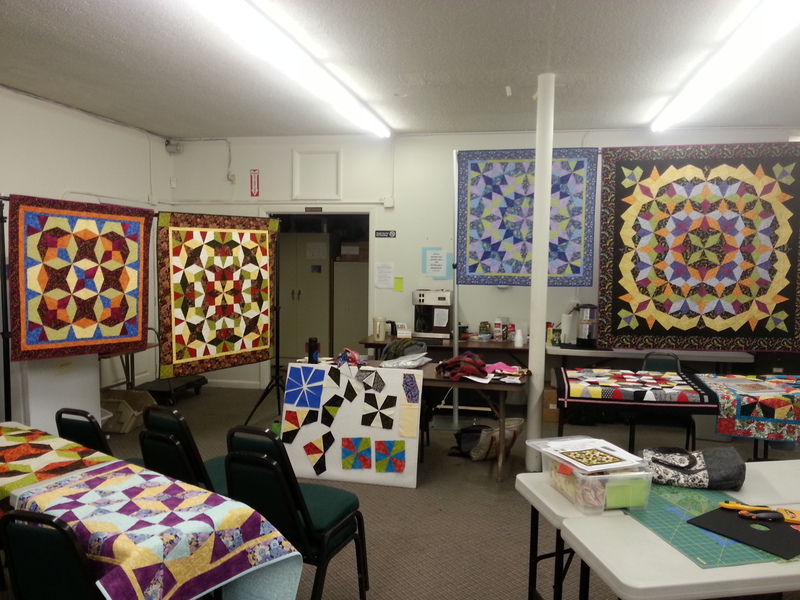 During my recent teaching trip to Clark County Quilters in Vancouver, WA, I was fortunate to stay in the home of Sandi Miller. Sandi is a prolific quilter who teaches and enjoys trying a wide range of techniques. She has a beautiful home, made me very welcome and gave me a quilt show of her gorgeous work. 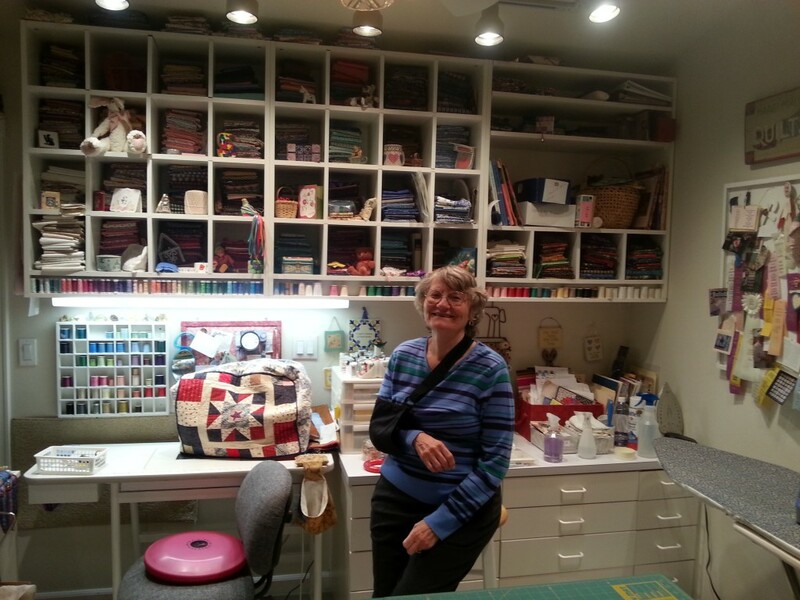 Here’s Sandi in her studio. 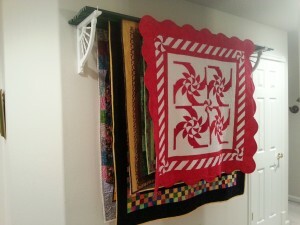 I loved all the cubbies for storing her fabrics and the little shelf along the bottom which is the perfect size for spools of thread. 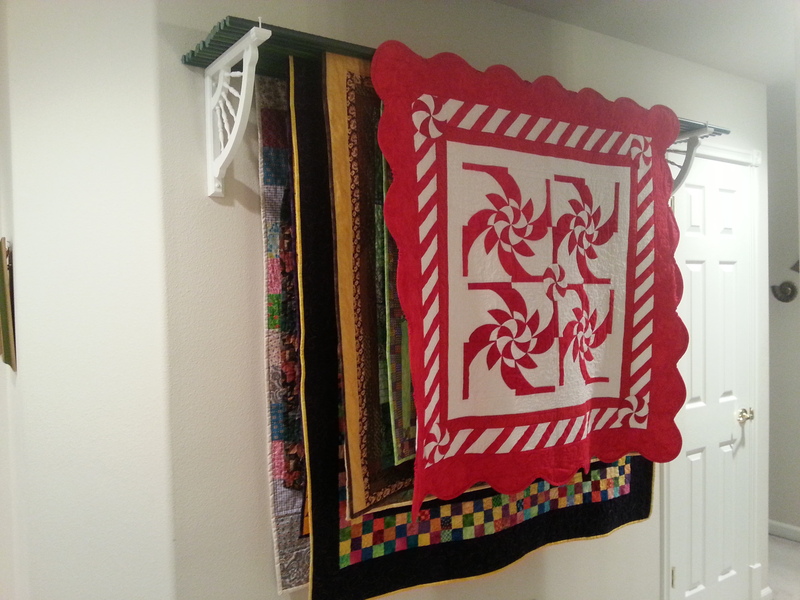 Sandi had an ingenious way of storing and displaying her wall hangings with several rods bearing quilts supported by the quarter-wheel bracket. 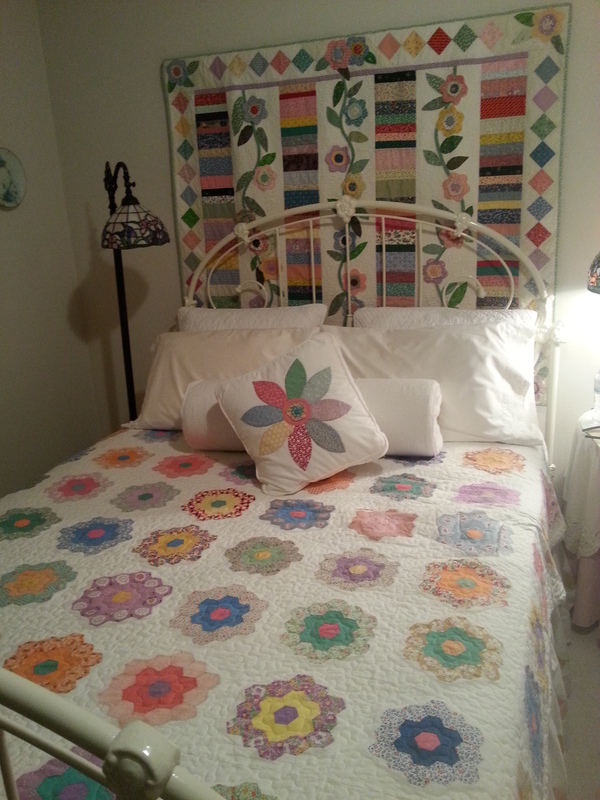 Here’s the bedroom in which I slept with a lovely Grandmother’s Flower Garden quilt on the bed and a matching applique floral wall hanging. This Flying Geese quilt with curved lines of geese and the black background caught my attention in Sandi’s stack. 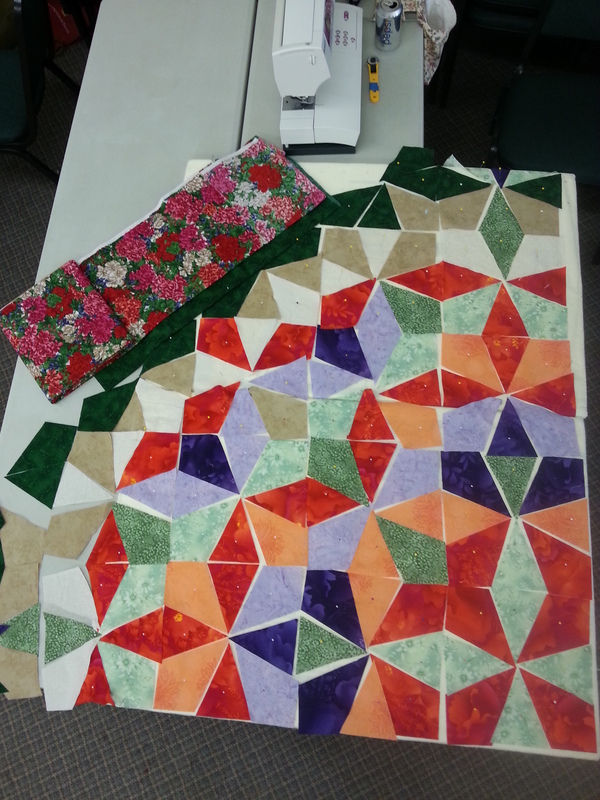 Sandi’s stunning floral quilt was begun in a Melinda Bula class. Thank you Sandi, for giving me permission to share. 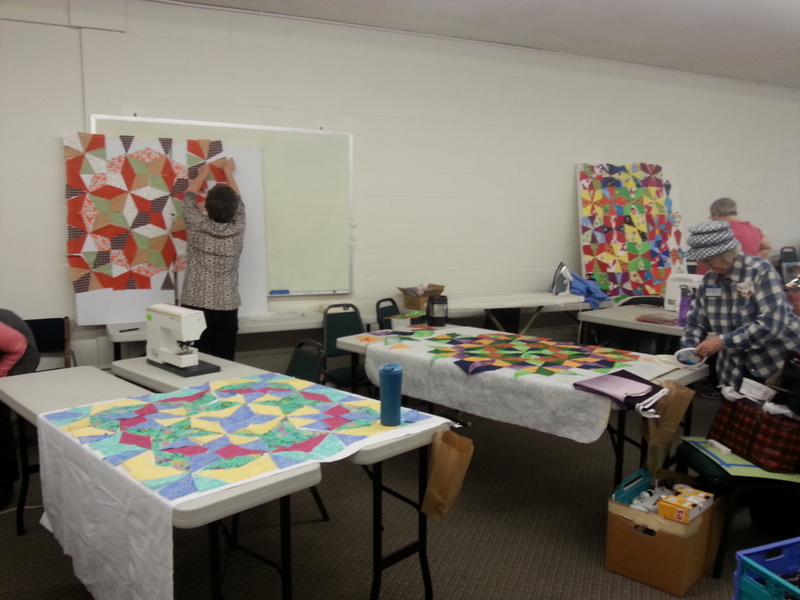 Last week I taught at Clark County Quilters in Vancouver, WA. This is a large and active group and over 200 attended my lecture. I always enjoy seeing what each student brings to class. 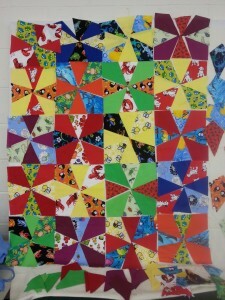 Everyone has different fabrics and visions for their quilts. In the Kaleidoscope Puzzle class, they have the opportunity to experiment and make their own designs from the assortment of kites and wedges they cut. See my video page for a demo of this technique. Here are my samples displayed in the classroom. 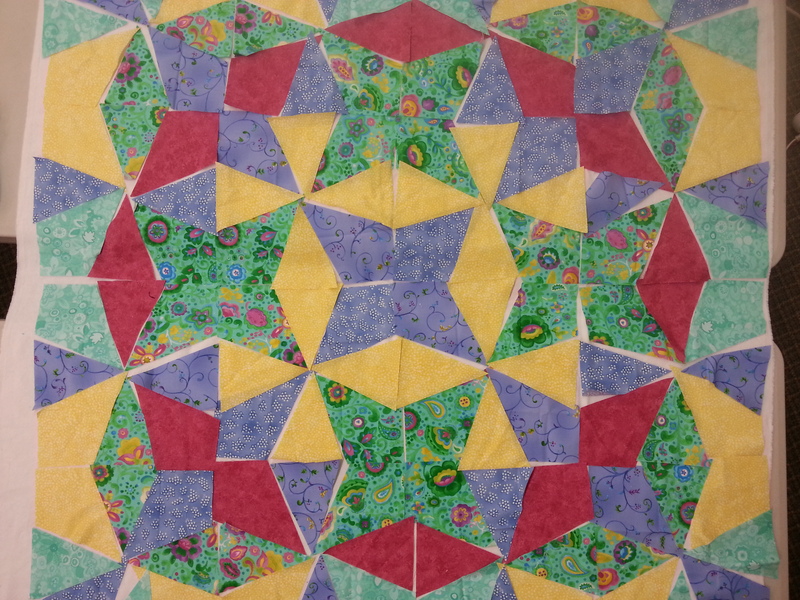 Students can use these patterns for inspiration or create their own. 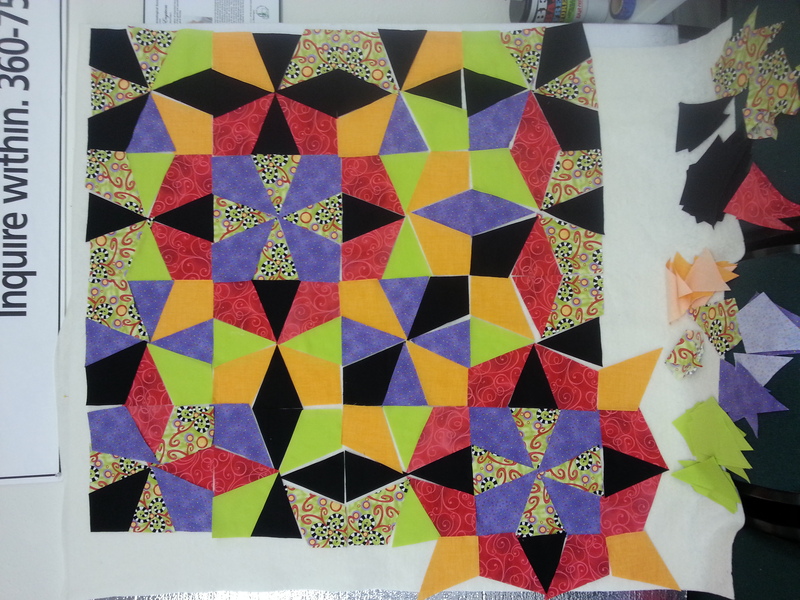 It’s fun watching the designs develop as the pieces are laid out. Students are also inspired by looking at each others’ work and I encourage them to walk around the room to see what is going on, compare notes and make suggestions to one another. It’s also good to stand back and view the design from a distance. Value is really important in this technique and the placement of the lights and darks make a big difference to the composition. I always recommend taking a proper lunch break so that students come back with a fresh eye for their work. As you can see, we had a good variety of fabrics and designs including scrappy and asymmetrical as well as the symmetrical. 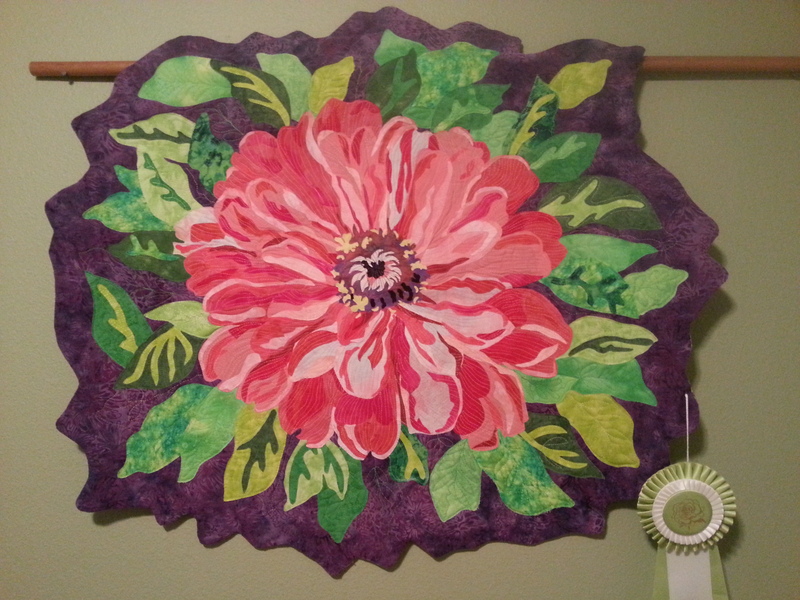 What inspires you when you quilt? I suspect that it’s not only seeing the work of others, or quilts in books and magazines. 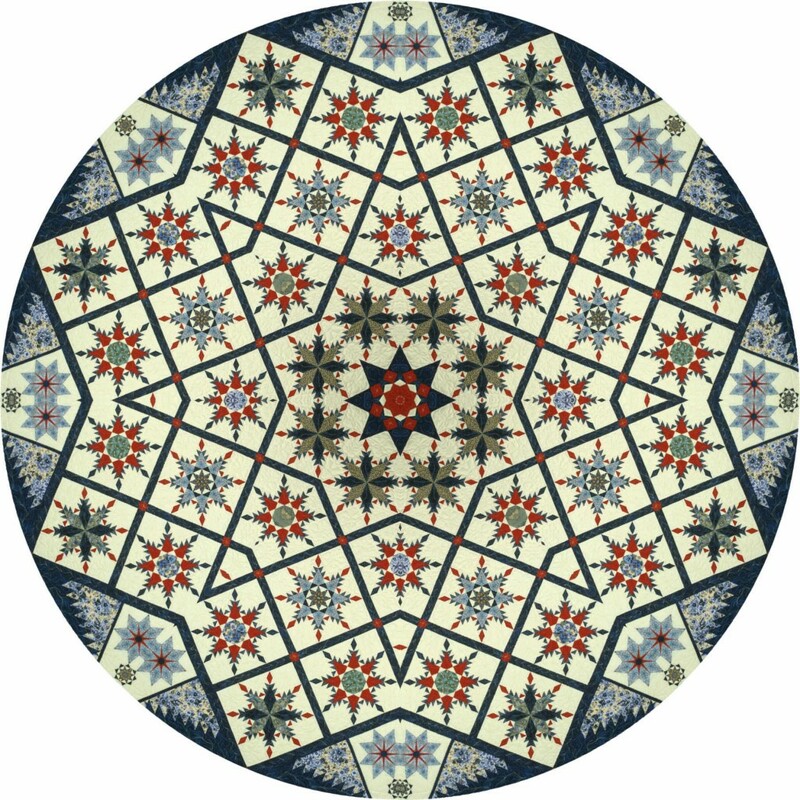 Patterns are in abundance in our everyday lives – in nature, architecture, furnishings, floors, windows, media and so the list continues. 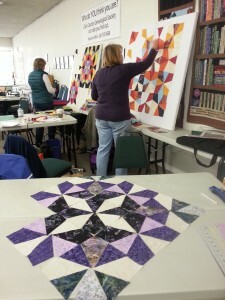 I believe that what we create in our quilting designs is strongly influenced by all of these and they provide us with inspiration.Staying open and receptive to seeing what is around us is fun and helps us build our store of ideas. 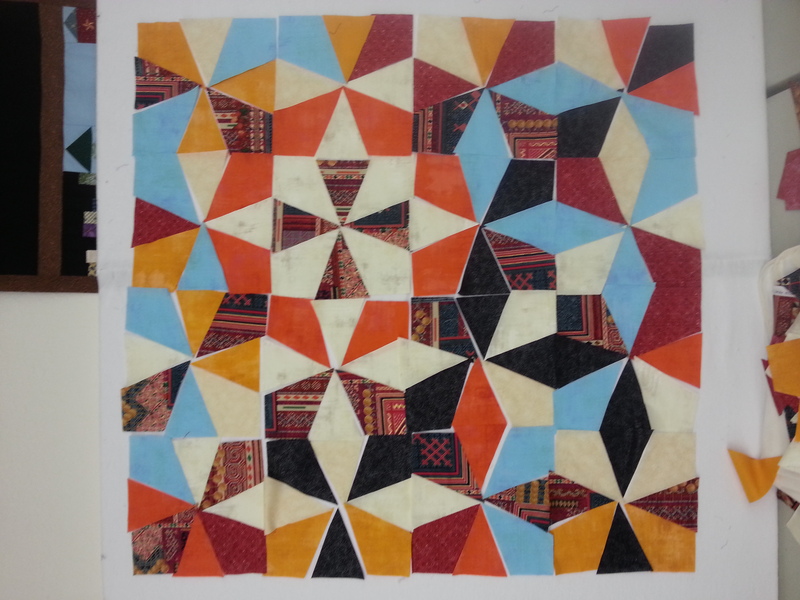 It may be a particular color combination, or a geometric design that gets us started and as the work evolves, other factors come into play based on our visual and life experiences, whether it’s traveling the world or staying close to home. 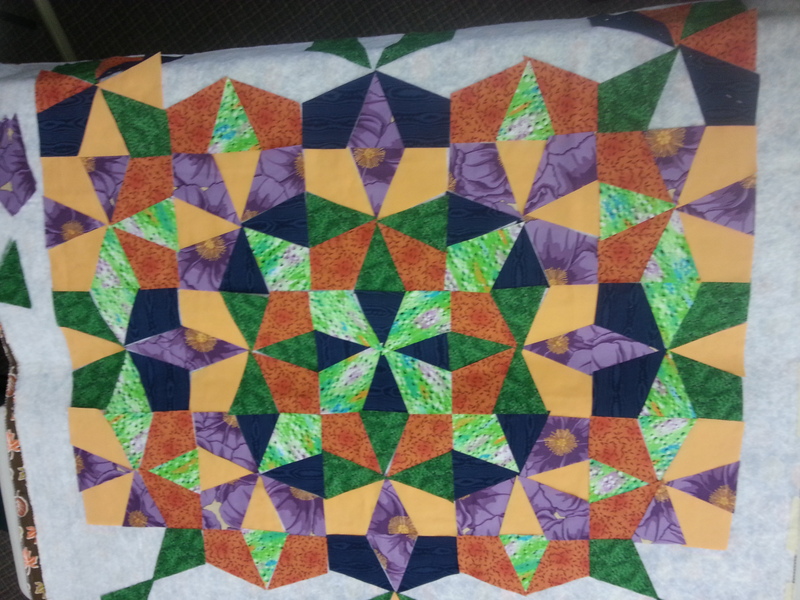 In this era of android phones, it is very easy to snap photos any time we see something that captivates our imagination and that can be stored for a future quilting project. 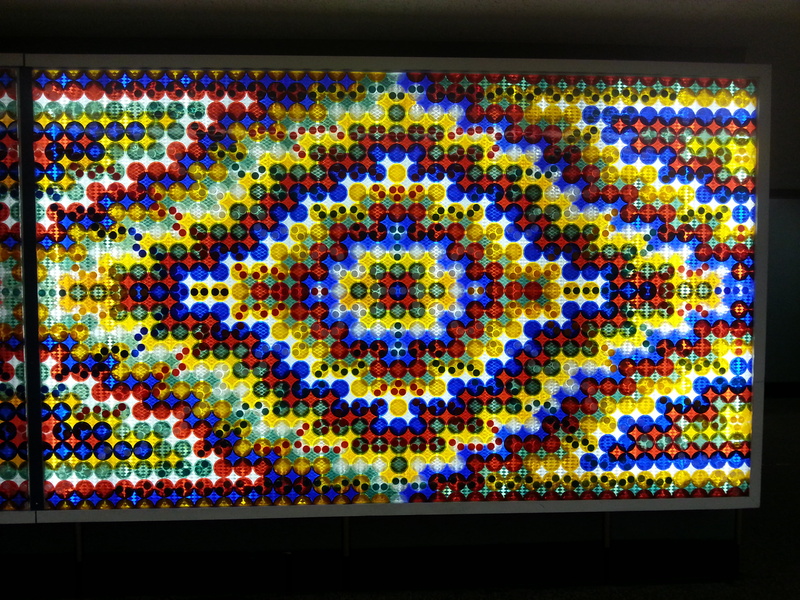 This graphic work of art hangs on a wall in the baggage claim area at Seatac International Airport. The photo shows only half of it. 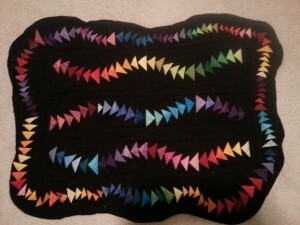 All the colored circles are reflective discs and this is a stunning vibrant piece.It reminds me of the Trip Around the World pattern (most appropriate for an airport). Unfortunately, there was no information on the artist. I snapped this one out of the plane window when I was returning home from Texas in mid-November. 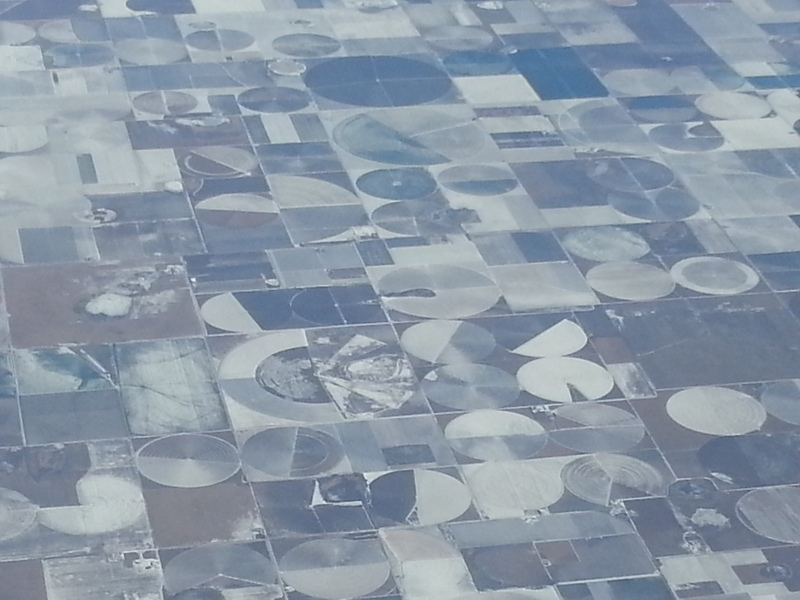 It was somewhere in northwestern TX or SE Colorado, probably not far from Amarillo, The light dusting of snow highlights the patterns created by the irrigation circles and it looks very quilt-like to me. Happy New Year! May 2015 be a stellar year for you! Many people make New Year resolutions, but it is often hard to maintain the discipline to follow through. I find it helpful to break down my goals into small chunks, month by month, week by week and even day by day. 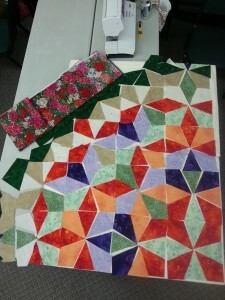 Large goals can be overwhelming, but doable when divided into smaller pieces. I’m a great list writer and every day have lists of things I want to accomplish. In 2014, my lists seem to have consisted of damage control and keeping up with the most urgent items. I haven’t had time to consider the long term goals for my quilting activities. However, despite the on-going difficulties, I continued to teach and thoroughly enjoy traveling and sharing my quilting passion with others. I feel ready to embrace the New Year with whatever it brings and I hope that you do too. 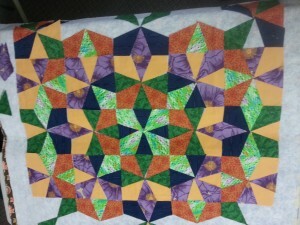 The image above was created using Kaleidoscope Kreator software on a photo of my quilt, Celestial Garden. 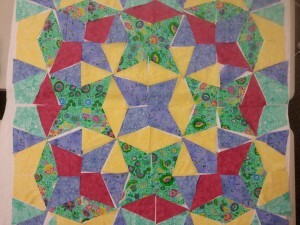 Here is a picture of the quilt, 84″ x 84″, which I made in 2002. 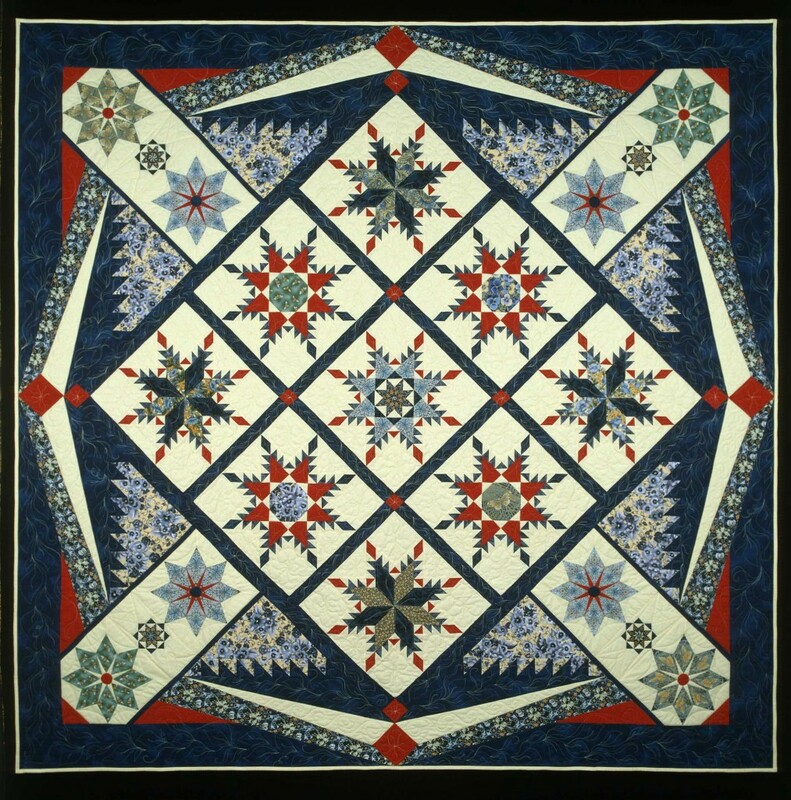 It was a finalist and placed 5th in the National Quilt Museum’s contest: New Quilts from an old Favorite: Feathered Stars.